138/365(+1), a photo by Luca Rossini on Flickr. Crazy day, while posting the daily pic from yesterday I found out my flight to the Netherlands wasn’t at 15.00, as I thought, but at 10.30. And it was 9.15. I ran out of the house and drove as fast as I could (without infringing too many laws) to the airport, where I arrived just to see the check-in closing. So it was too late for taking off, but early enough to change the ticket for another flight. It costed me 50 euros, and I got a seat in the 15.00 flight. So, it was a mess but my day was saved. I went to the University for an intranerual recording, then I returned home for lunch, closed the bag, arranged the dog, and took the train to Fiumicino. One of the great things about our new apartment is that it is a 5 minutes walk to the Trastevere train station, where trains to the airport depart regularly. It’s a fantastic benefit if you happen to travel a lot. The hand luggage control went so quick that I found myself at the gate more than one hour ahead. Good thing, since tomorrow it’s our wedding anniversary and I still have to buy Claudia a nice present. I tried with Bulgari just to find out that I could afford at most a (horrible) keychain. Crazy. I had more luck with Swarovsky, where I found a gorgeous necklace that the saleswoman convinced me to pair with a ring. Amazing stuff. Same price than that (trust me, really horrible) Bulgari’s keychain. I’ll never get the whole luxury idea, I guess. I added to the basket a bottle of great wine for the guy who’s hosting us in Leiden, and than I finally took off. 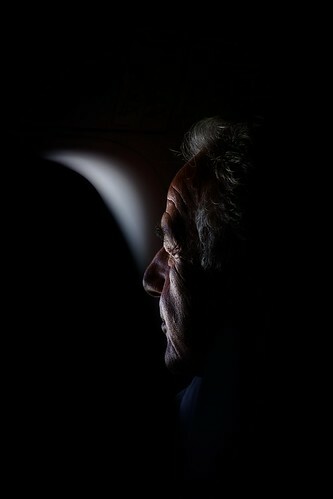 During the flight I had the chance to secretly get this candid portrait of the man sitting in the row behind mine. He was looking out of the window and his face was flooded with this amazing white-blueish light. Bottom line of the day, Claudia loved the present, Agata flashed up when she saw me back in town, Dario enjoyed the wine, and we all together freaked out during the football match when the Italian team played one of the best matches ever disputed in its history. really a great portrait and also a terrific performance of your compatriots yesterday! thanks man, both for the nice comment and for the fair play !